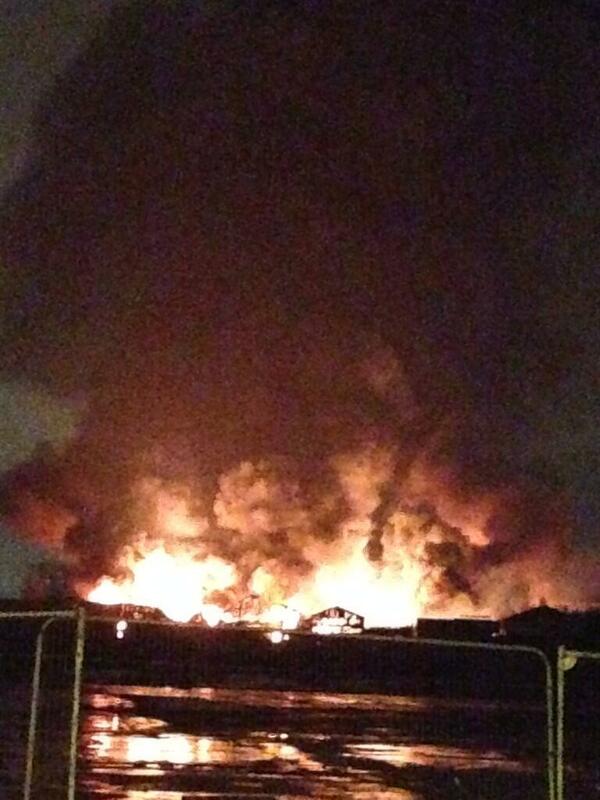 80 firefighters were tackling the blaze in the Armley area of the city at the height of the fire. It broke out at a building used for storing chemicals on the edge of a city centre. People living in the centre of Leeds reported hearing a number of loud explosions as smoke and flames dominated the city's skyline for a number of hours. Residents in the Albion Way area have been asked to keep their windows and doors closed as 15 fire crews from across West Yorkshire continue to fight the flames this morning. A fire service spokesman said the blaze was now surrounded but it may take the rest of the day to extinguish the fire, especially as a collapsed building was making firefighting efforts technically difficult. The fire at Tradpak Recycling spread to two other buildings but crews managed to save four other businesses on the industrial estate, officers said. There are also reports the nearby Canal Mills arts and music venue was evacuated during the night. "It's been a really big job. We've had approximately 100 firefighters on scene - 15 firefighting appliances, two aerial platforms, a high volume pumps and various support appliances. When the initial crews arrived at just after two o'clock this morning, the fire was well developed and there was a series of large explosions where LPG cylinders were involved in the fire. Unfortunately two premises have succumbed to the fire but we've managed to save four surrounding companies and their premises, which is a really good effort by the firefighters in the initial stages. Mr Dunkley said a fire investigation team was on site but it was too early to say what caused the blaze. West Yorkshire Police spokesman said the force was called at about 2.34am. The Armley Gyratory road - one of the main routes into Leeds city centre - was closed as a precaution due to the smoke. "Fifteen fire engines were deployed to the incident and cordons were established around nearby streets. Due to concerns about large amounts of smoke the Armley Gyratory Road was closed but has now re-opened. Roads remain closed around the site on the industrial estate itself. Firefighters said another firm involved in the incident was the packaging company Hazel Products. "We greatly regret having to inform our customers that Hazel Products has suffered from a fire that started in the early hours of the morning on Monday 21 April 2014. Hazel Products is continuing to trade from a temporary location. Firefighters were called out at 1:50am this morning to Albion Way, after the fire broke out on an industrial estate. West Yorkshire Fire and Rescue Service said 15 firefighting pumps are at the incident. A spokesman said the "large building fire'' had spread to another adjacent property and two aerial appliances and numerous specialist appliances were also at the scene. Eyewitnesses have posted Twitter pictures of the huge blaze, which has sent thick black plumes of smoke high into the air. A West Yorkshire Police spokesman said the force was called at about 2.34am. The Armley Gyratory road has been closed as a precaution due to the smoke.